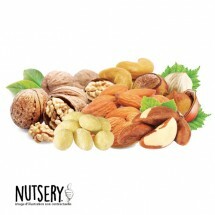 NUTS' MIX Er is 1 product. The perfect mix for a little snack! "Are you NUTS?" "Oh yes I am!" The special feature of this mix is ​​that it is exclusively composed of dried nuts: Cashews, Almonds nature and white, Walnuts, Brazil Nuts and Hazelnuts. Delightful!